If you wish to maintain your lawn in tip-top condition during this fall, it would be pertinent for you to acquire the best leaf blower available in the market; especially during fall when most trees are shedding and your lawn is probably littered with fallen leaves. These appliances are, thus, a must-have for people who own a house adjacent to a beautiful lawn. A perfect lawn deserves the best leaf vacuum in order for you to maintain its look. A well-maintained lawn is a lovely sight and can lend any house a sophisticated look. It requires planning and hard work to get the right look for a lawn. Once acquired, a perfect lawn can be the pride and joy of the owner. After all, it takes a lot of effort and dedication to maintain a lawn in top condition over a period of time through the vagaries of seasonal changes. A simple leaf blower will help you clean your lawn and blow all the excess leaves onto the adjacent streets or into huge piles, which will then have to be discarded through other means. The best leaf blowers vacuums, on the other hand, will take care of everything from blowing and collecting excess foliage to mulching it. This streamlines your task and makes it that much faster and easier to clean your lawn. Apart from vacuuming fallen leaves scattered on your lawn, there is also a wide selection of other tasks that a good leaf vacuum can perform. These range from clearing out light accumulation of snow to cleaning gardening equipment, vacuuming shorn grass clippings, and extricating broken and matted grass. 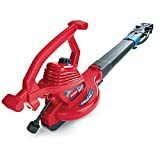 These appliances come in quite a few variations, such as corded or cordless, gas powered or electric leaf blowers, etc. Which variant you buy depends on your specific requirements and your priorities. Weight and noise produced during vacuuming are some prime criteria to keep in mind as you would want the leaf blower to be lightweight and as noiseless as possible. Depending upon the size of your lawn, you should also make sure to get a leaf blower with adequate blowing speed. 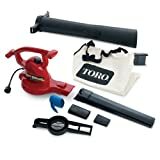 This leaf blower vacuum is an excellent offering from Toro. The UltraPlus is the most high performing gardening appliances of Toro’s line with a variable blowing speed of up to 250mph. It has a blow mode capacity of 350 CFM and a vacuum mode capacity of 410 CFM, which is high enough to provide a good quality air flow and suction. The appliance comes with a shreds-all shredding ring that uses the metal impeller to provide mulching functionality. This allows you to not only clear your lawn of all foliage debris but also to reduce its volume by up to 97%. The oscillating nozzle provided alongside the vacuum blows air in a wider path to cover a large space. Thus, it does not require the person wielding the device to keep moving their wrists constantly throughout the process of using the vacuum. This handheld leaf vacuum mulcher is portable and easy to use outdoors. The cord can be stored by just wrapping it around the storage hook that is provided with the kit. The kit also includes a bottom zip bag for easy storage of blower parts and components. 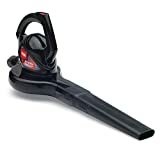 This handheld leaf blower is very lightweight and portable at only 4.6 pounds and measures around 16.5”x7.9”x11.8” in width, length, and height. It is the perfect device with which to vacuum scattered leaves on lawns and across sidewalks and driveways. The regulation of air flow is adjustable on this appliance and offers two settings for greater variation in use. While the lower air flow setting is more suitable for tiny and close spaces, the higher air flow setting is most effective in open lawn spaces. Unlike the best gas leaf blower vacuums, this one runs on electricity and comes with a cord. The Toro Ultra leaf blower and vacuum mulcher is one of the strongest and most powerful devices available. It is the perfect leaf vacuum for people living in windy areas who see a lot of debris accumulation during fall or due to storms throughout the year. This corded leaf blower offers great versatility of usage due to its multiple settings for regulating the air flow. The lower settings allow you to use it in confined spaces while the higher settings make it a beast of a machine in open spaces. This mulcher is also very effective and can reduce the volume of leafy debris by 88% to less than half an inch. The metal impeller that comes attached with the device increases the reflectivity of the mulching function by a considerable amount. The vacuum bag attached to the vacuum has a strategically positioned zipper chain that enables quick release of mulched debris. This lends the device ease of use as you do not have to constantly carry around leafy remains while vacuuming. 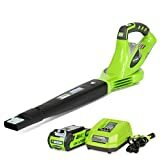 This leaf vacuum is also furnished with a built-in quick lock for the cord that connects it to the electric outlet powering it. This ensures that the cord is always attached to the blower. Storage of the cord is also an easy task as it comes with a cord storage hook that can be attached to the cord while the extension cord can be wrapped around the vacuum pipe to save space. This 20 volt leaf blower from Worx can be used for a variety of gardening tasks. These may range from blowing and sweeping your lawns, driveways, and sidewalks to drying, vacuuming, cleaning, and dusting patios. It’s lightweight and compact built enables you to use it both outdoor and indoor. This multi-purpose leaf sucker comes equipped with an extension hose that can be attached to its vacuum tube. This enables the appliance to be turned into a vacuum cleaner for interior spaces. The attachable and detachable Detail Dust Brush is especially effective in vacuum cleaning window sills, computer keyboards, and other such hard to reach and delicate spaces. Other detachable accessories that can be added to the vacuum tube include an Inflator Nozzle and Deflation Cover, Short Tube, and a Wide Nozzle. Their functionalities range from inflating or deflating fitness equipment, pool toys, etc. to managing the air flow or blow drying recently washed items. This cordless blower from Greenworks offers six variable air flow speeds up to 150mph. With a run time of 14 minutes, the Greenworks cordless blower works effectively in lawn spaces of up to half acres. It weighs at a minimal 3.3 lbs and comes equipped with a push button start that makes it very easy to carry around and use. The biggest advantage of using this cordless blower is that you do not have to contend with the hassle of gas spillage or pull start cords. This easy to use leaf blower is perfect for blowing and gathering leaves in a medium sized yard or garden. It comes with the added benefit of not making as much noise as most gas-powered lawn vacuums. 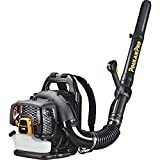 The two-piece blower tube attached to this leaf blower lends the wielder of this appliance greater control in directing the air flow with precision. The extension tube that can be attached to the blower further helps to increase the reach of the appliance. This ensures that the job gets done in less time and in a more efficient manner. 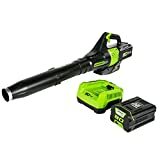 This 80volt leaf blower and vacuum is powered by a lithium-ion battery that offers a run time of up to 22 minutes on one charge. Its blowing and vacuuming functionality can work in lawn spaces as large as 1 acre. This leaf blower is environment-friendly since it offers no risks of gas spillage and does not cause noise pollution. The Greenworks PRO comes with an all handle access that offers you immense ease of use. Along with a comfortable over-mold grip, the handle also contains a variable speed trigger. This can be maneuvered to achieve the perfect air flow speed to increase the range of functionality in both indoor and outdoor spaces. 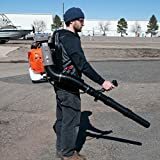 Tool Tuff TEMP UNAVAILABLE Gas-Powered leaf blower, 80cc back pack leaf leaf blower. This powerful leaf blower from Tool Tuff is gas powered and comes with an 80cc backpack for carrying the fuel. This appliance is the largest one in terms of size offered by the company, weighing at 32 lbs with a fuel tank capacity of 2.8 quartz. It comes with a very powerful and easy to start engine. An added advantage of using this machine is the ease of acquiring spare parts if the original ones get damaged after extensive use. Due to its powerful motor, it can clear out a large volume of leafy debris and even rocks and gravel strewed across lawns or parking lots. This machine can also be used to clean up warehouses and factories. The Poulan Pro offers a powerful blow up for clearing out leaf accumulations and other yard debris across large lawn spaces. This particular yard blower vacuum comes with a 48cc backpack for holding the fuel that powers the equipment with no mulcher functionality. This appliance works best in large outdoor spaces and comes equipped with a heavy-duty frame. It also has a variable speed feature to better regulate air flow, lending it variability in its usage. The cruise control feature makes operating the device pretty smooth. The X-Torq engine is especially designed to increase fuel efficiency while reducing harmful fuel emissions. Thus, despite the machine being powered by gas, it is comparatively more environment-friendly. With this appliance, you get the high power of a gas fuelled leaf blower with none of the environmental drawbacks of these types of machines. Thus, it is quite apparent that there is a wide range of lawn blowers currently available in the market. This large selection with their mind-boggling technical features and specific terminology can be quite baffling for a new homeowner venturing into lawn maintenance and gardening. If you are such a newcomer or even an old hand who wants to try out the new innovations in leaf vacuuming, the first step is ascertaining your priorities. If you have a smaller lawn and convenience and ease of use is what you most want out of your lawn vacuuming experience, then you can go for any of the cordless options from our list. They may not offer as much power but make up for it in their ease of use. If, on the other hand, you have a huge pile-up of leaves or rocky debris to clean up and do not mind some noise, then you should opt for gas-powered leaf blowers. Last but not least, the corded Toro leaf vacuums offer the best of both worlds in terms of engine power, ease of maneuverability, and portability. Go through our above-mentioned list carefully and figure out your exact needs and requirements before you make your final decision to buy the best leaf blower and vacuum for yourself.